ConceptDraw DIAGRAM is a workflow diagram software contains specific features help you to draw diagrams faster, such as RapidDraw, or Arrows10. There is also a rich set of samples and templates to give you an example of data may be visualized as workflow diagram. 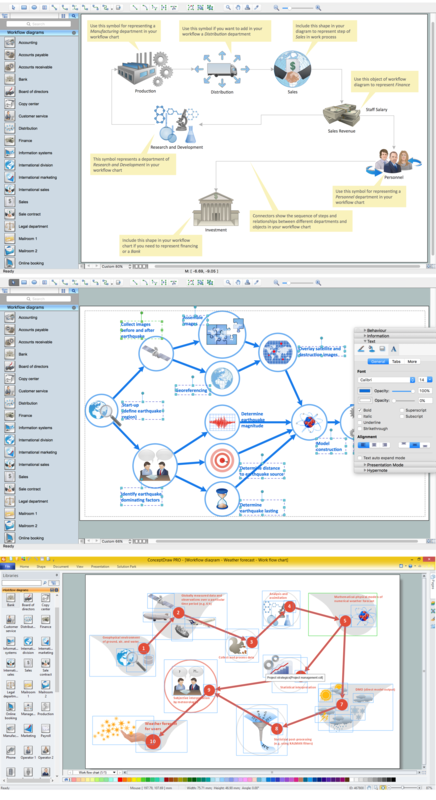 ConceptDraw DIAGRAM is a software for simply depicting the workflow diagram. The Workflow Diagrams solution contains pre-designed libraries and templates. This type of diagrams represents the transferring of data, documents, and tasks during performance of a work process. A workflow diagram is less general notation than a process flow diagram. Workflow as a term can apply to organizational process which involves people, resources, documents, sort of data, for instance; whereas a process is general collection of steps occuring in any sort of activity. That is why process flow diagram can be used as workflow diagram to describe business process, data flow or department interactions. The fastest way to create a workflow diagram is using pre-designed workflow template. ConceptDraw DIAGRAM v12 with the Workflow Diagrams solution delivers rich set of workflow diagram templates you may start from.